If you were to ask me- What is that one thing which when done you would say "ah that was what relishing the challenge was all about"?, I wouldn't bat an eyelid before answering. For as long as I can remember, there has been just one wish in my mind. One daredevil act that I want to do before I bid adieu to this beautiful world. One that I have seen being done a million trillion times by others, on TV, in movies and reality shows. I want to go to New Zealand. No, that is not the challenge. 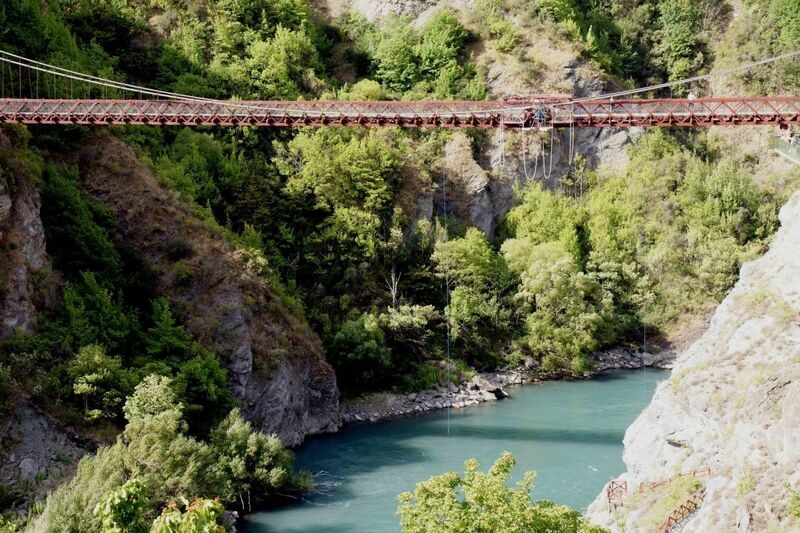 I want to go to New Zealand and do Bungee jumping. Yes. Sounds crazy? Hell no! I have no idea when this desire crept into my soul, but it has been slowly eating its way within me and is now ready to come out bursting like a volcano. Incidentally I have a dear friend in New Zealand who has done this act once, a few years ago. I recall having a conversation with her about how i long to visit her country for this very purpose. She keeps pulling my leg saying "you don't want to come here to spend time with me, you only want to come here so you can complete your wish?" Why do I want to do this? I cant really put a finger on it, but probably just to feel the rush and do it in a place where it is most famous. No matter what anybody says or does, this is a wish that will always linger on in my mind. It holds the Numero Uno spot in my Bucket list [yes, I do have one] and shall be ticked off before I complete the journey called Life!! 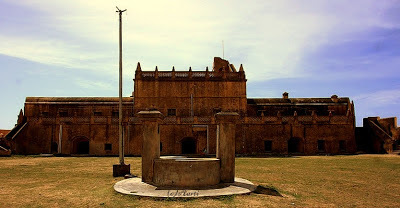 Tranquebar (Tharangambadi as it more commonly known) is a small town in Nagapattinam district, about 45kms from Chidambaram and 15kms north of Karaikal. The name literally translates to "a place of the singing waves". It was a Danish colony from 1620 to 1845, and today a getaway destination for many. There is a Danish Fort, Church and the Governor's Bungalow to see, apart from the shimmering ocean. 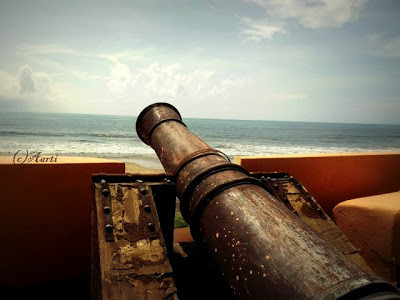 It was around this time 5yrs ago when my friend called asking if I would like to go to Goa? I was excited and replied "ofcourse". She then went on tell me about her dad's timeshare in Sterling and promised to get back to me with dates. After a few emails, the dates were finalised- 30th Oct to 5th Nov. She then forwarded the email her dad received from the resort with the confirmation details. I was eagerly looking forward to the holiday and had informed another friend of mine about the same. She chimed in saying she would like to come with me. Since her contract at work was coming to an end around the last week of Oct, she was all set. It was around 4th or 8th Oct when I began looking for flight tickets, found them expensive, went on to look for train tickets and nearly booked them when she dropped a mini bomb. Her contract was being extended and she couldnt take time off. Yikes, what do I do? Do I go alone or cancel the reservations and think about it at a later date? These were the questions running in my head. I spoke to my friend who was gifting me the holiday and came to a conclusion. I was going to go ahead, albeit alone! I dint know if this was going to be Relishing the Challenge or dreading the same. But all I knew was I was back to being excited. I packed my bags, including the laptop [yes, I carried a bit of work with me], camera and just about everything else I would need. Want to know the highlight of the trip? The train journey. I had booked myself on the only direct train to Goa. The train leaves Chennai every friday around 2pm and reaches Goa the subsequent day 1.30pm. Yes, you read it right. 23hour journey. And I was booked in a sleeper class compartment [meaning non AC].. People around me looked at me as if I had lost my mind. "You are going to Goa alone?" "You are going to be on the freaking train for nearly a day, and that too alone?" "What? non ac , that too nearly 24hrs- you are mad"
"How will you manage in Goa alone? "Cancel the trip and go later"
And so there I was, in the train, in a near empty compartment. There was a lone guy besides me, he was sleeping in one of the berths in the next booth and looked like a vagabond/drunk/tramp.. 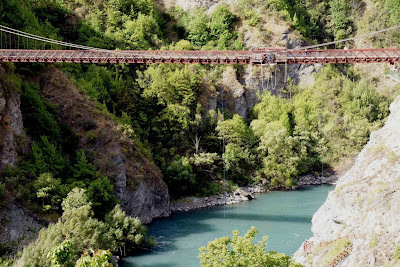 I was a wee bit scared, especially since I had quite a bit of luggage with me and there was no way I could even go to the loo without worrying about my stuff. Luckily, another couple boarded the train just as it was about to pull out of Chennai station and it was good to see other faces. The tramp guy was chased out by the TTC. What a train journey that was. I enjoyed every minute of it and now when I look back, I wonder what I did to kill those 23hrs.. I must have listened to music for a while, read a book, slept, walked up and down, observed the people around in the platforms and stared at the watch to see how much longer was left before the train came to a halt at Margao. 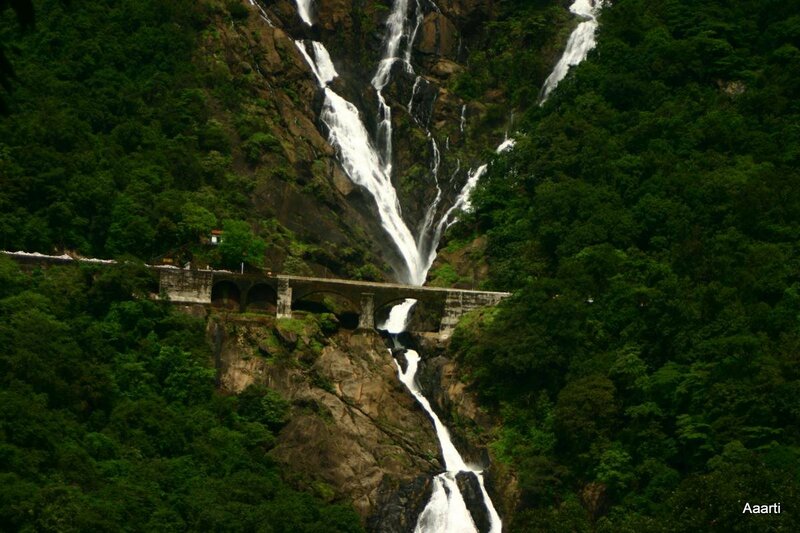 I do remember sitting on the steps near the door as we approached Dudhsagar falls and gaped in awe at the beauty.